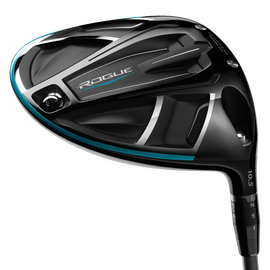 Jailbreak Distance with Increased Forgiveness The Rogue Driver delivers exceptional ball speed from the combination of our new Jailbreak Technology and X-Face VFT plus increased MOI for a breakthrough in driver performance. Rogue employs improved Jailbreak Technology with new, hourglass-shaped titanium bars that are 25% lighter, while fulfilling their function to stiffen the crown and sole. The stiffer body allows the face to take on more impact-load to promote faster ball speed, and makes possible our new X-Face VFT face architecture, which promotes fast ball speed across an expansive area of the face. Together, Jailbreak and X-Face VFT work together to create what we call the Jailbreak Effect, which promotes a remarkable boost in ball speed and distance. Callaway is the leader at using carbon composite materials to enhance metalwood performance. Our proprietary triaxial carbon composite is extraordinarily light and strong, saving substantial weight. We’ve redistributed that weight into the head’s perimeter to significantly increase MOI and forgiveness, which helps preserve distance and direction on off-center hits. Rogue has the largest triaxial carbon crown of any Callaway driver ever. Callaway offers a wide range of premium aftermarket shafts at 40g, 50g, 60g, and 70g weights, including Aldila Synergy, Aldila Quaranta, Project X EvenFlow, and Project X HZRDS Yellow.